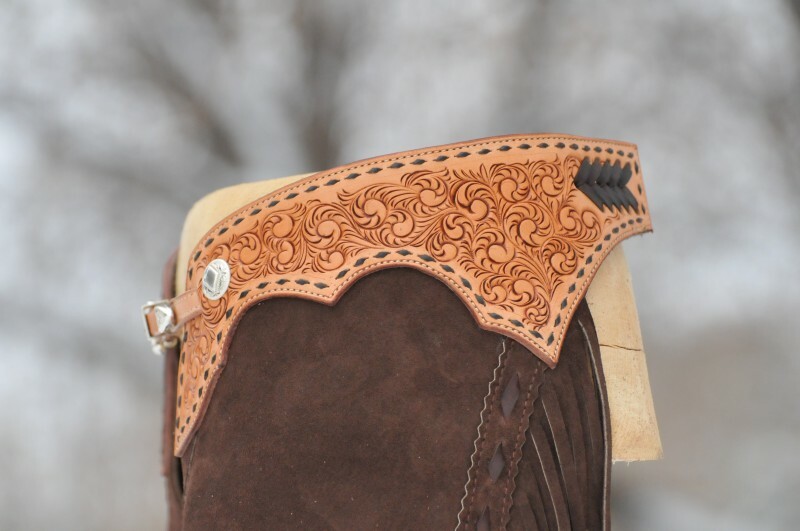 Tooled and dyed yokes with buckstitch detail. 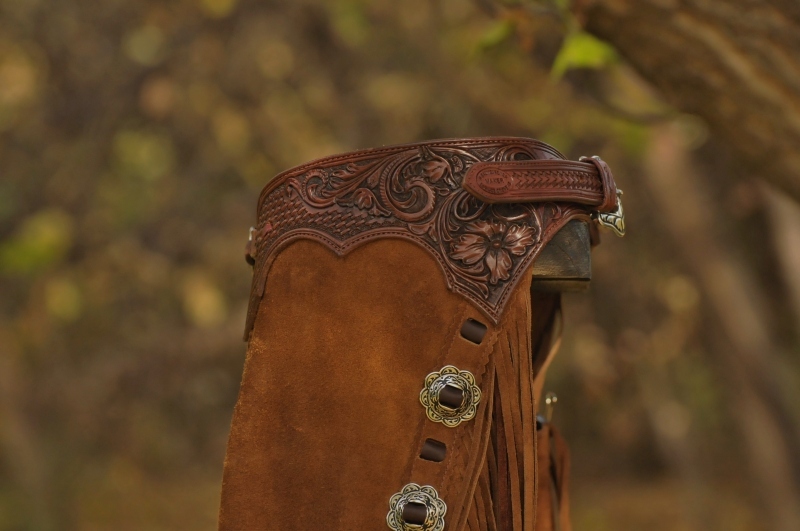 Silver overly concho at back sides. 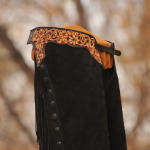 Tooled and dyed yoke, pocket on each leg, lace and silver overly conchos down the leg. 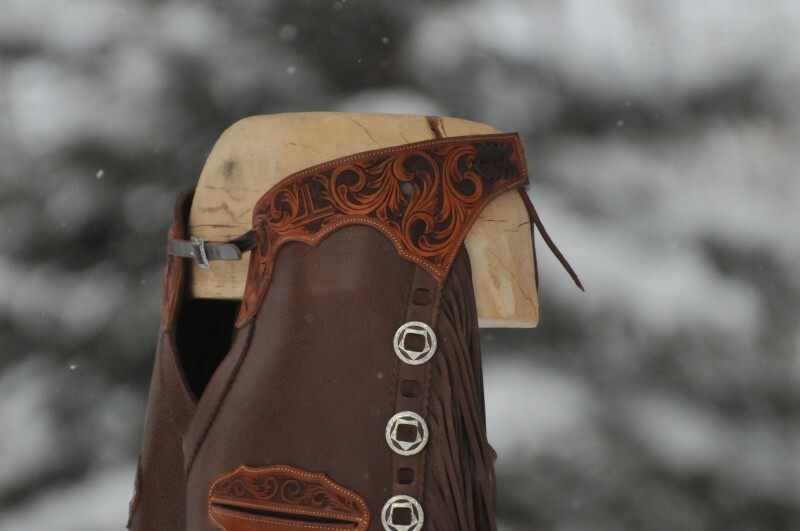 Topgrain leather. 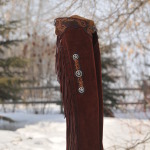 A custom pair of mahogany colored chaps, hand carved leather tops and copper spots were created for western artist Paige Albrecht of Trochu, Alberta. 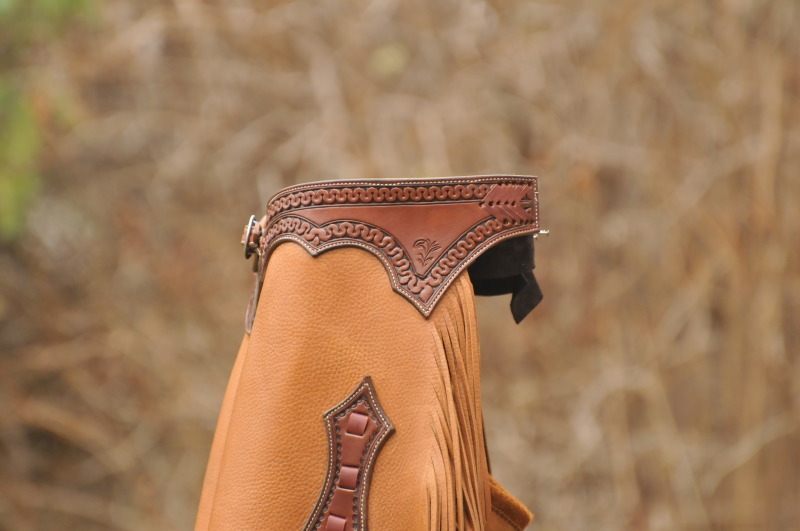 Finger cut yokes with buckstitch detail. 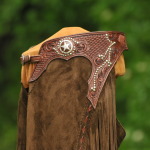 Silver overly concho and buckle, loop and tip. 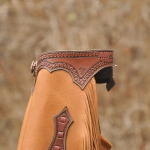 Dark brown split leather. 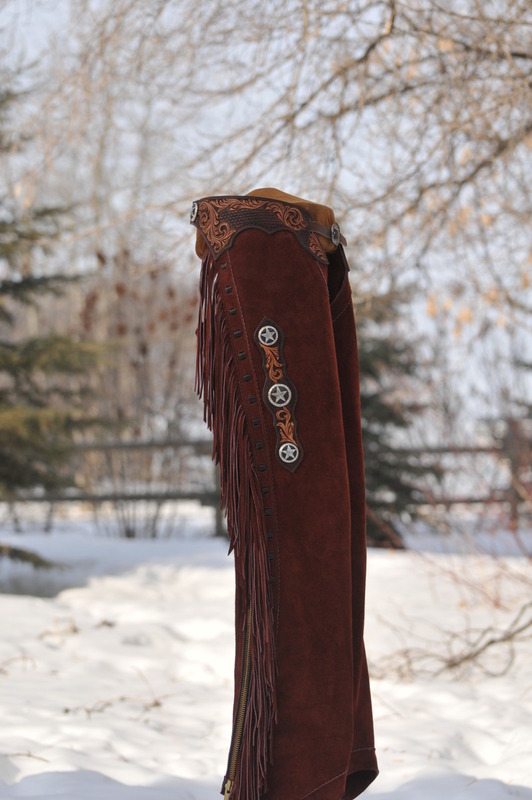 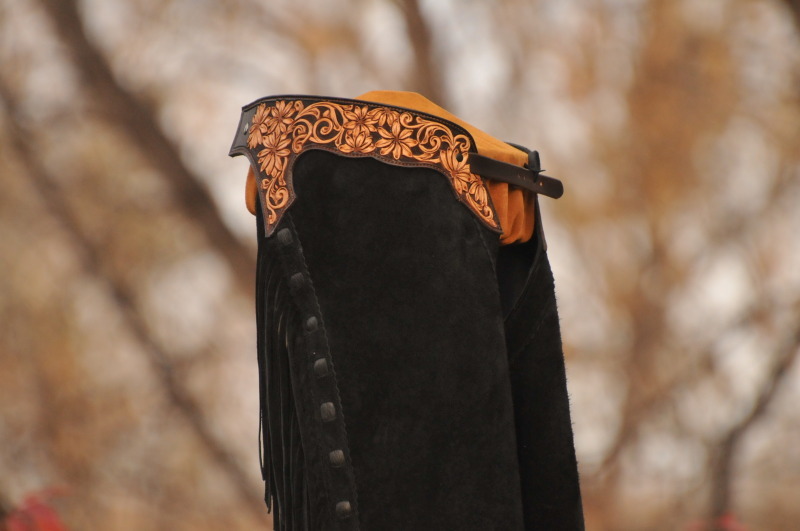 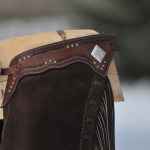 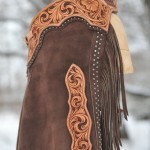 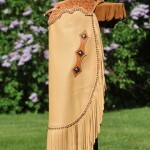 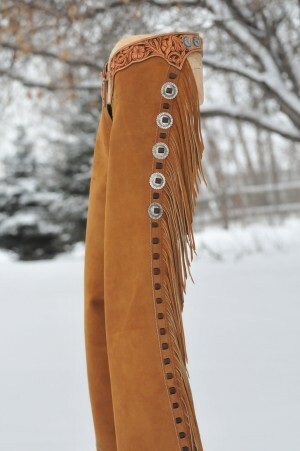 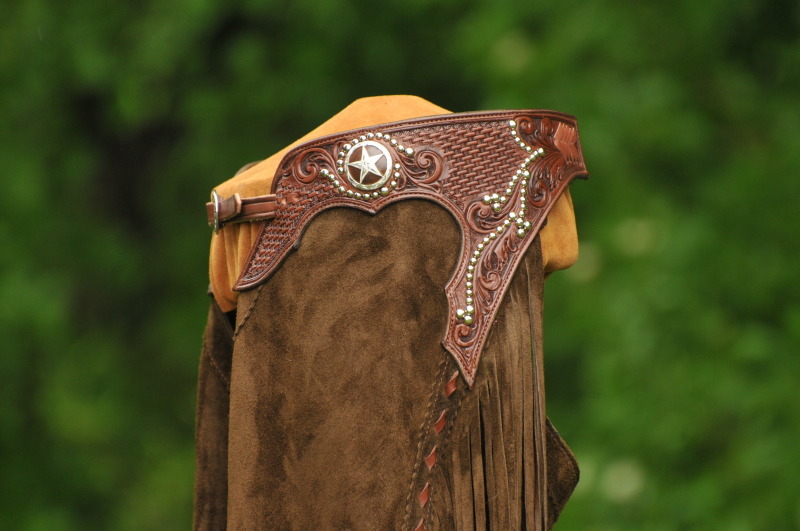 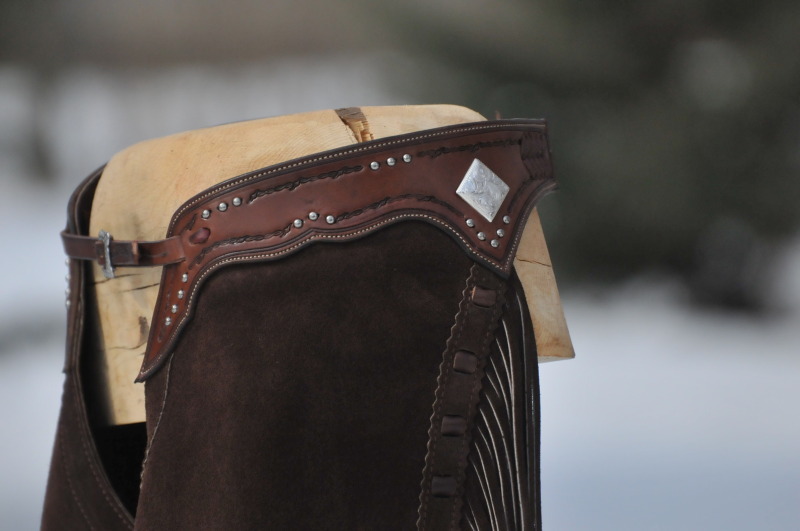 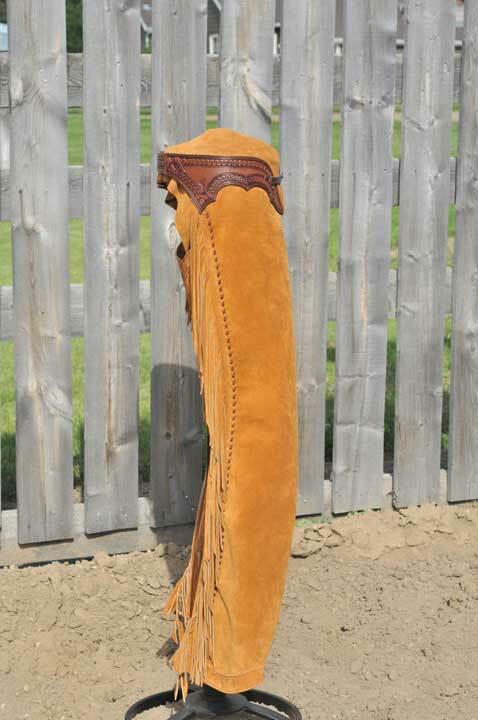 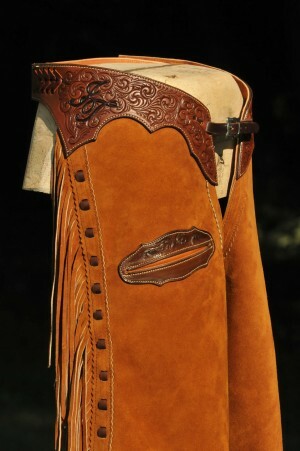 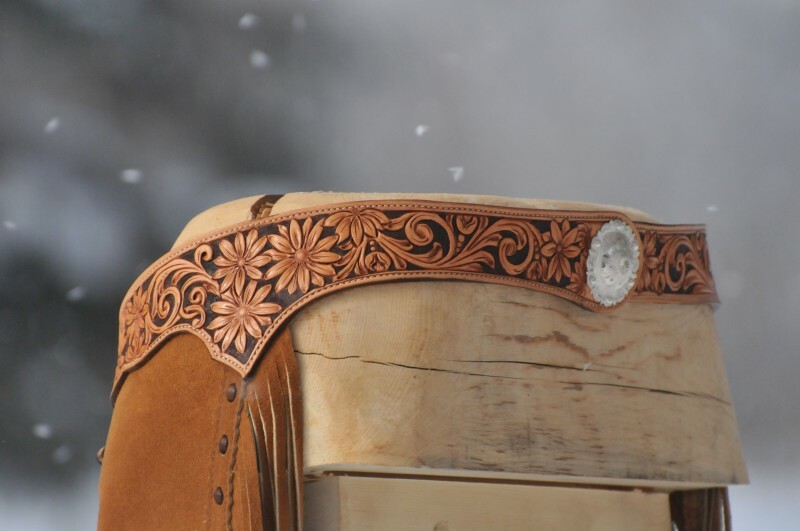 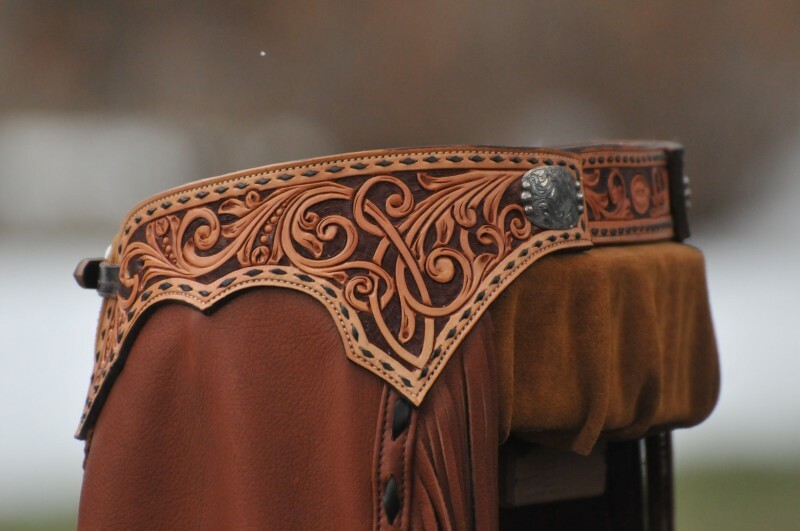 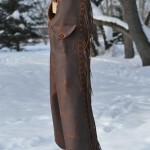 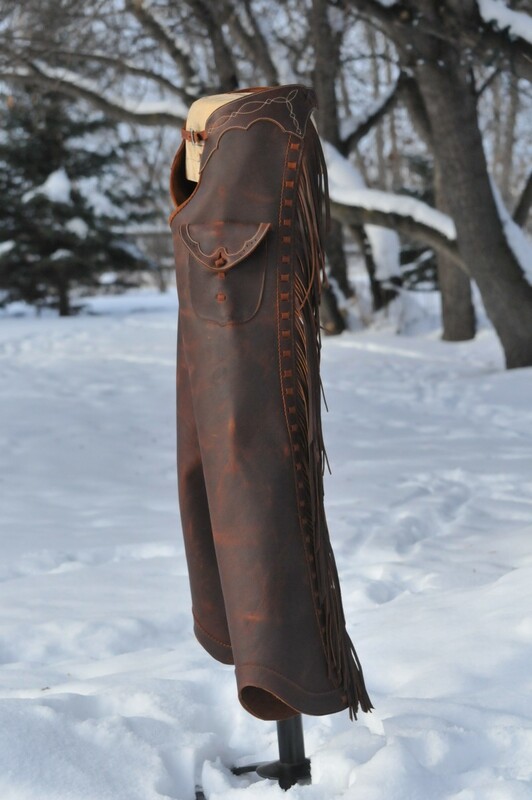 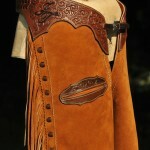 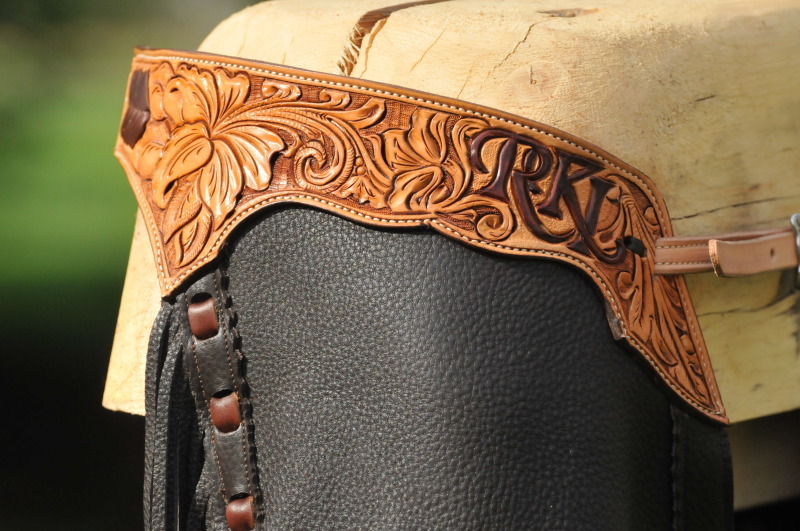 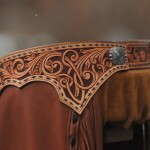 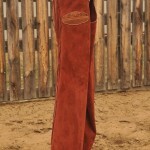 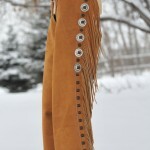 A uniquely stamped leather top accents this custom pair of chaps for Cutting competitor Maureen Stewart of Edmonton, Alberta. 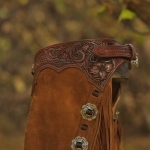 Dark brown partial tooled yoke, with JW conchos, side buckle. 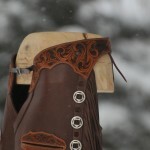 Tooled and dyed yokes, leg shields. 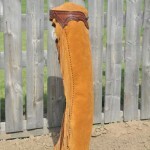 double spots down leg and around yoke. 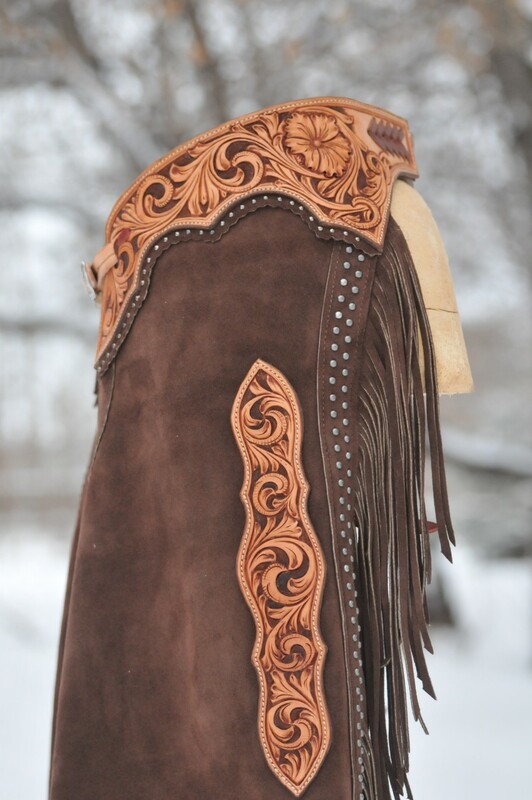 Dark brown split leather. 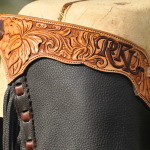 Black topgrain leather rough side out. 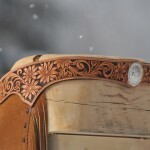 Daisy design dark black/brown dye to edges. 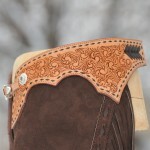 Custom design dark brown topgrain leather, lace down leg.